Having managed to escape both 2016 and 2017 without a single Nakaya purchase, I was not so lucky in 2018. I bought two Nakaya’s in a frenzy in early February. I was idly browsing the nibs.com website one day when I stumbled upon my grail pen…the Nakaya Dorsal Fin Version 1 in Ao-tamenuri finish. I actually mention this pen in this very post way back in 2014. I knew I had to pounce and didn’t have much time to cosider nib options. I quickly opted for a ruthenium- plated Broad Stub. I clicked the buy button and waited. I asked for a hybrid cursive italic/ stub for my Dorsal Fin 1. I had selected the cursive italic, and then elaborated in the “additional comments” section that I wanted it as smooth as a stub. Basically a stub but with a thinner cross stroke. I opted for a “Medium to Heavy” ink flow, then specified 8/10. I’m not sure if that is “Medium- Heavy” or “Heavy”. All I know is I did not want “dry”. The only slightly negative thing I would say about this pen is the cap is much lighter than I expected. It’s much lighter than the 17mm and its shorter too. That seems strange as the Fin is created by adding multiple layers of urushi. I believe this process takes about 6 months to achieve. I would have thought all that urushi would add some weight. To me it seems like it has less urushi on the cap than on the barrel. But I could be imagining things. I will try to get some weight measurements. The nib is perfect with a good flow and the requested additional smoothness to the cursive italic Broad. The ruthinium-plating looks great. The real negative for me was the customs process and the mahusive customs charges I paid on getting this Dorsal Fin and the Naka-ai into the UK. But that is an issue I have with this UK Government (one of many!). Whilst I was browsing for my Dorsal Fin Version 1, I happened to spot a Naka-ai in Ama-iro finish also “in stock”. After the disappointment of 2015’s Piccolo, I was wary of the Ama-iro finish, but the sky blue looked so optimistic, so thought I’d give it another shot. 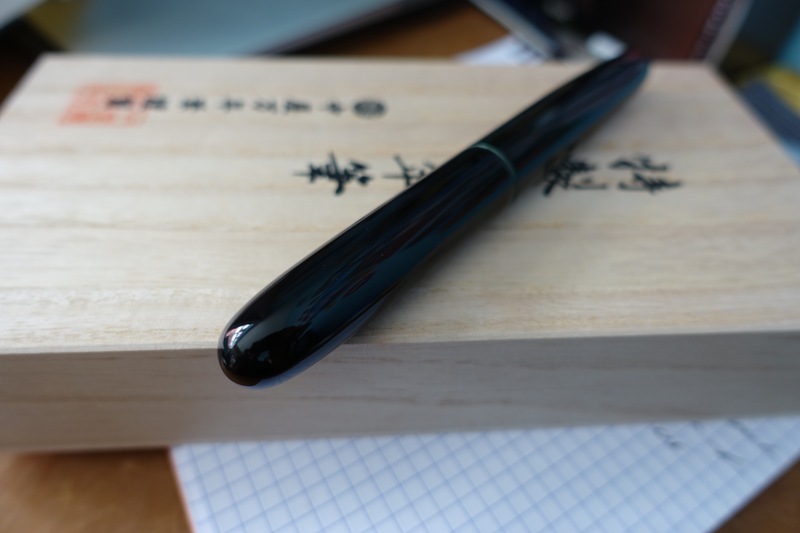 This time the Nakaya was offered in the Naka-ai shape. I much prefer larger pens, and in addition to the issues with the condition of the Piccolo I had, the tiny size was also a problem. I had not seen the Naka-ai in person before, but had read it was quite a substantial size, with a larger section and an attractive tapered shape. I quickly decided I would go for a Double Broad Stub nib and with Rhodium-plate this time. With hindsight, I would have had the nibs the other way around- the BB nib in the Dorsal Fin and the Broad CI/Stub hybrid nib in the Naka-ai. Yup, looks ruthinium to me. Verdict: I really like the shape of the Naka-ai. The tapering is very attractive and it is also a very good length- same as the Dorsal Fin 1 but shorter than my 17mm Portable. The section as you can see from the pictures, is shorter and narrower, but I find it very comfortable to use. The Nakaya nib also looks more in proportion on the Naka-ai because of this. Some people have said the nib on the 17mm looks too tiny in proportion to the section and barrel. I don’t agree, but definitely the Naka-ai looks more harmonious. The colour of the Ama-iro is exactly as I would like it. It’s not really a bright sky blue like some I have seen, but more of a natural colour, quite sober, austere and to my liking. Not an in your face blue. I have read somewhere that Nakaya take their urushi colours from nature, and if you want a custom colour, you have to pick one from there massive list of “colours from nature” pdf. I like this idea. Quite in keeping with the Nakaya brand. The nib? Oh. My. Days. That’s a British expression. No I don’t know where it came from, probably someplace in the 90’s… I asked for a Double Broad Stub on the Naka-ai with a “heavy” ink flow. It does not disappoint. The smoothness of this stub is like no other stub nib I owned. I currently have it filled Ishida Bungu, Hakodate Twilight, which only accentuates the smoothness even further. I will take a writing sample and post up later. Needless to say I am happy with it. I managed to avoid buying a Nakaya for the whole of 2017! Victory! I managed to avoid buying a Nakaya for the whole of 2016! …this is what I found. 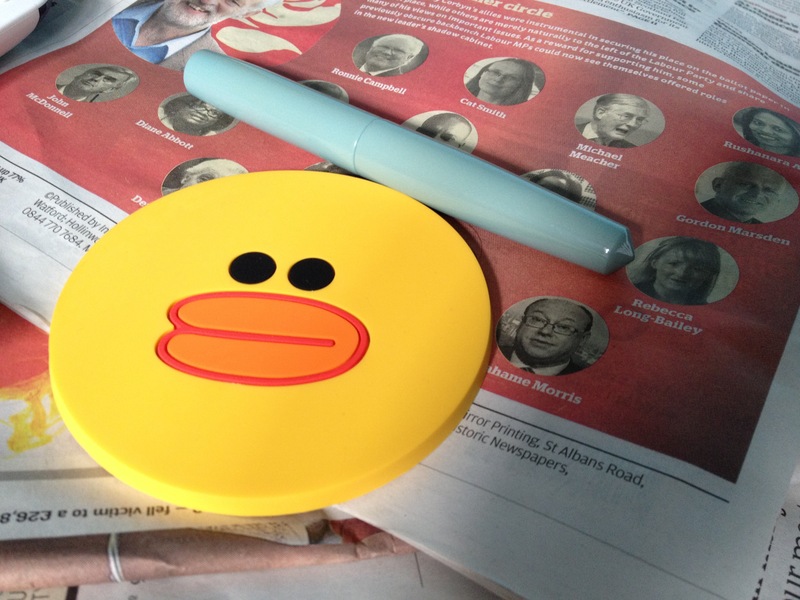 At first glance the Ama-iro finish turned out to be a nice duck- egg blue and looked quite smart. However, on unscrewing the cap I found the section threads were stained black, and there was serious discolouration to the section. A kind of yellowy- orange. This may because the pen is very old, but I don’t think this finish has been around that long. Although in pictures the outside looks undamaged, there is some strange movement in the urushi near the end of the cap, like a load of urushi had been dolloped there. Very strange. The finish of my previous Nakaya’s have been so perfect, they almost don’t look man- made at all. Not so with this Piccolo. 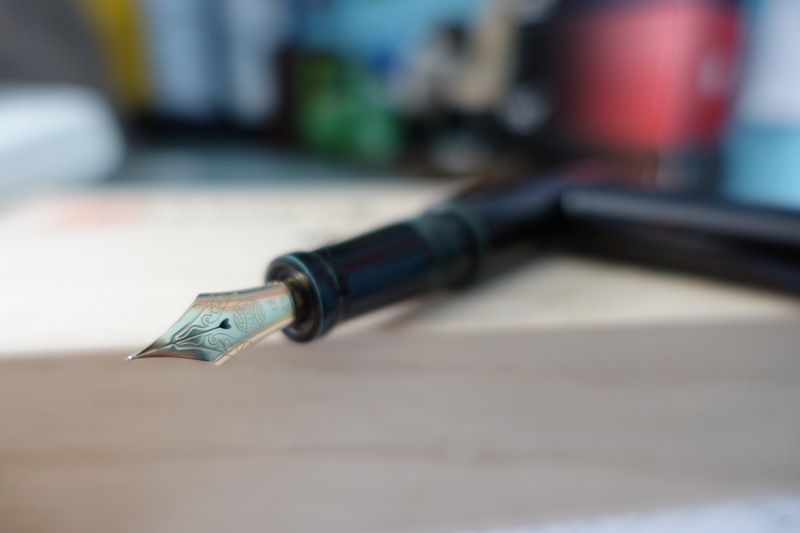 The nib was advertised as “firm-fine cursive italic rose- gold nib”. Part of the reason I purchased the Piccolo was because of the ready- customised nib, and the fact it was in the higher spec rose-gold, which I did not have on any previous Nakaya. The nib was a pleasant surprise, not firm at all but with some nice springiness, and with a nice crispy cursive italic grind. It seemed to me more like a medium width or wider. Maybe a soft-medium with cursive italic grind. Here is a fuzzy writing sample of the Fine, crisp CI nib…some decent line variation at least. A close up of the section. As you can see there is quite a step down in the Decopod model between barrel and section. I found this to be a bit uncomfortable, as I tend to hold my fountain pens a further back from the nib. The section itself is a good comfortable length. Although you can’t really see from these photographs, I found the Ao-tamenuri finish on the Decopod I got more to the moss green side, than blue/ teal side. I would have preferred if it had tended more to the blue. I believe the inconsistency in colour was the reason for Nakaya discontinuing the Ao-tamenuri finish. I went for a firm fine gold colour nib this time. Gold was the only colour available at the time. If you buy direct from Nakaya or nibs.com you can ask for Rhodium or Ruthinium-plated gold nib, which some people prefer on the black finish Nakayas such as Ao-tamenuri, Midori-tamenuri and Kuro-tamenuri. I don’t really mind the gold colour with the Ao finish, and think it looks quite sharp. After all Danitrio nibs are always gold as far as I’m aware, as are Namiki Emperor nibs. 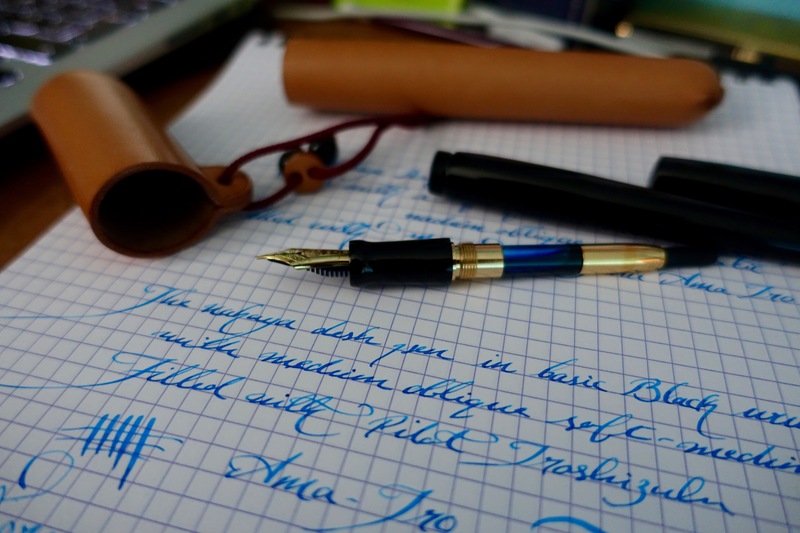 It’s only when it comes to Nakaya that people seem to notice the fact the nib is gold colour. As to the nib itself, it arrived nicely tuned with a decent wetness, writing smoothly but with that lovely Nakaya feedback. I like the looks of the Decapod, and the Twist is an even flashier (flashy as far as understated Nakaya’s go), version of that model. It is a decent size and adds some interest to the usual Portable, Naka-ai and Neo-standard shapes. However, the colour of the Ao in my model wasn’t really to my liking, and the steep step between the barrel and section was also a bit uncomfortable. 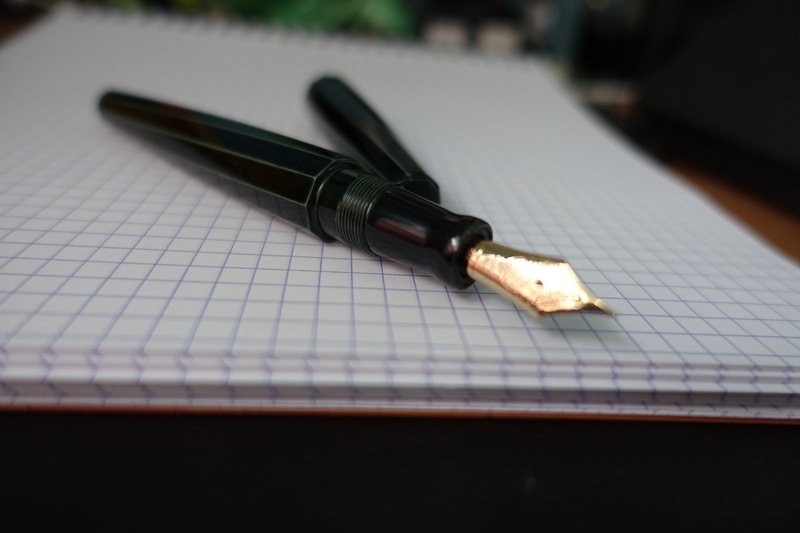 As to the nib, it was to my liking and perfect for journaling, but also nothing special compared to my other Nakaya nib. In the end I ended up parting with the pen, but I would still heartily recommend this model, and for those who hold they’re pens closer to the nib, it would be no problem at all. …one of the last Portable Cigar’s in Ao- Tamenuri. This is the 17mm version. I hadn’t heard of this before, but after some quick research found the 17mm referred to larger diameter of the section compared to the regular Portable Cigar. 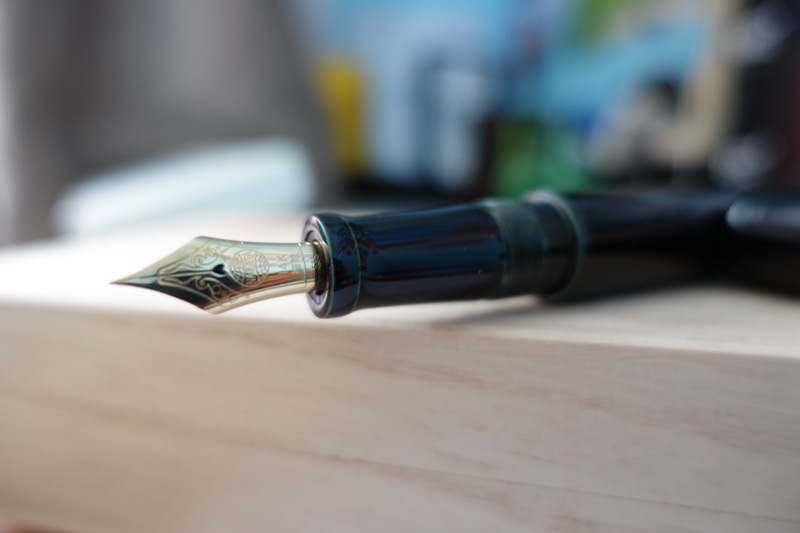 Close- up of the soft fine nib with added flex. Still, not that flexible. 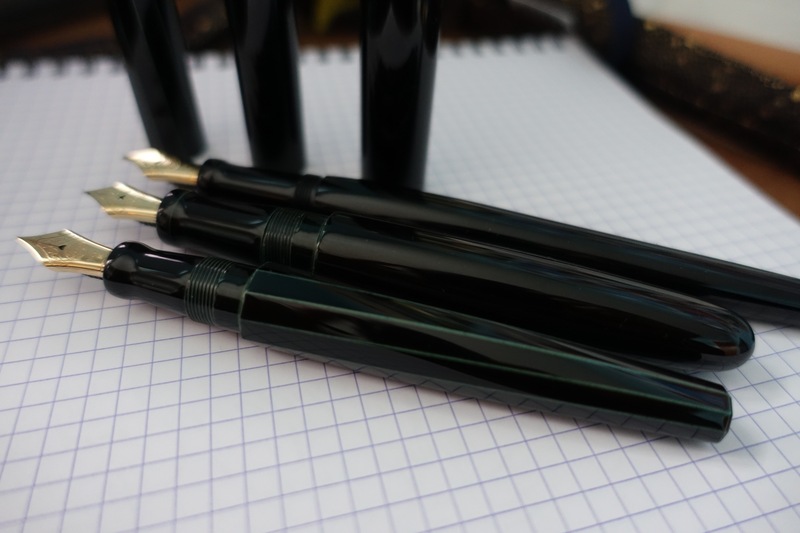 Here is a size comparison of all three Nakaya’s. A sombre looking bunch but I prefer these to the more earthy Aka/Shiro/Heki-tamenuri options. In photographs it’s difficult to show the Ao-tamenri finish of the Portable Cigar. It’s fat waist is VERY visible however! This Ao-tamenuri finish really is my favourite and as of 2015, I had not seen it offered by any of the other Japanese fountain pen brands specialising in Urushi. I wish I had heard about the Ao-tamenuri finish being discontinued earlier so I could have grabbed a Naka-ai or Neo-standard. Oh well. I recently had a cull of my Executive- level fountain pens, but in 2015 I seem to have accidentally replaced them all with Nakaya’s! This is the basic black urushi edition. I actually prefer this to the more popular Aka-temenuri red, that I had on a Piccolo Cigar. 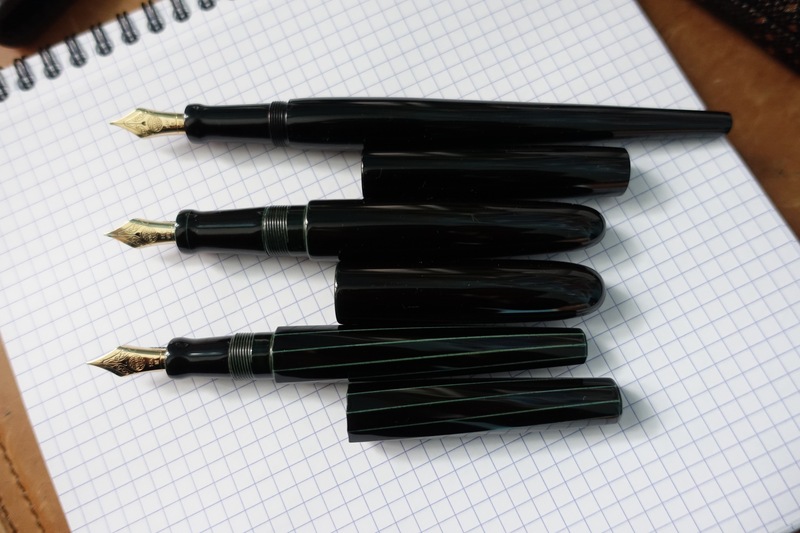 The black urushi deskpen model is currently the cheapest Nakaya finish/ fountain pen combination you can buy. 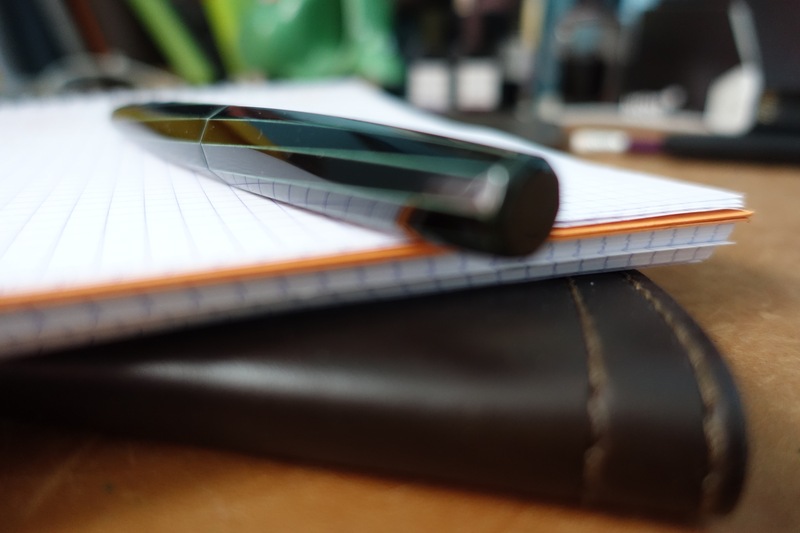 I’m not sure why this is as the Nakaya Desk Pen is an extremely substantial fountain pen and very well balanced…much more so than the tiny Piccolo. 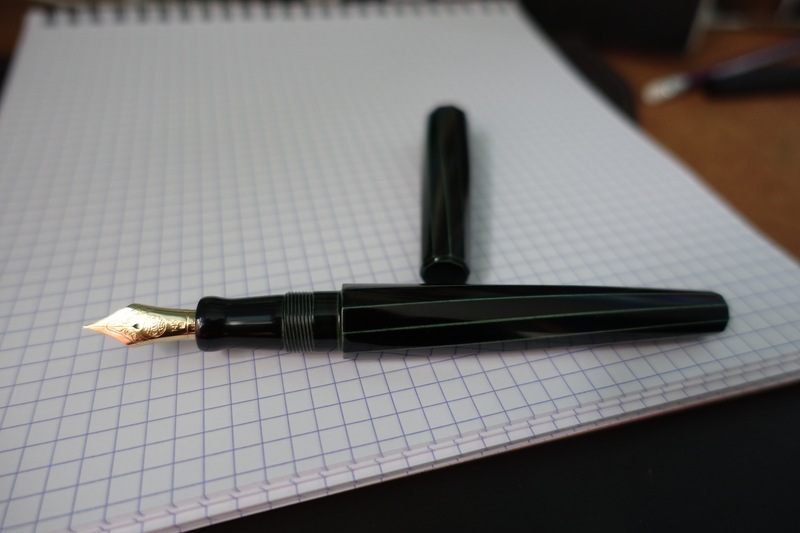 This is a clipless fountain pen. I do not believe clips look right on Nakayas, except on the Neo-standard perhaps. 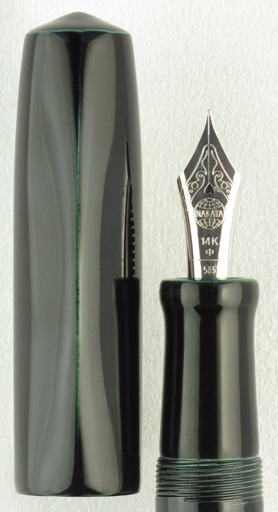 I had this nib customised from a Nakaya soft-medium to a medium-oblique (OM) with added flex. I believe it improves my handwriting no end. Soft- Medium nib ground to a Medium Oblique with added flex…shading! 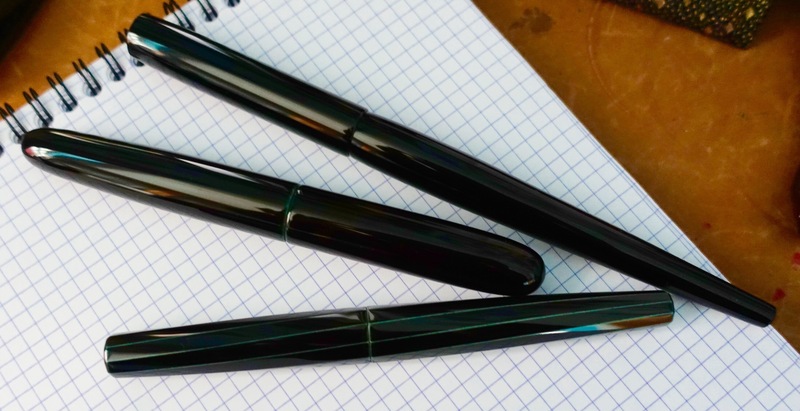 Unlike most other premium fountain pens in this price bracket, it uses a cartridge converter. It somehow doesn’t detract from the quality of the pen. The most unusual and mystical urushi finish Nakaya currently produce, is the blue-green Ao-Temenuri. This cool palette has a very modern look to it, and unsurprisingly has become very popular over the past year or so. The Ao- Temenuri finish of the Dorsal Fin No. 1, is my No. 1 choice for my next Nakaya. 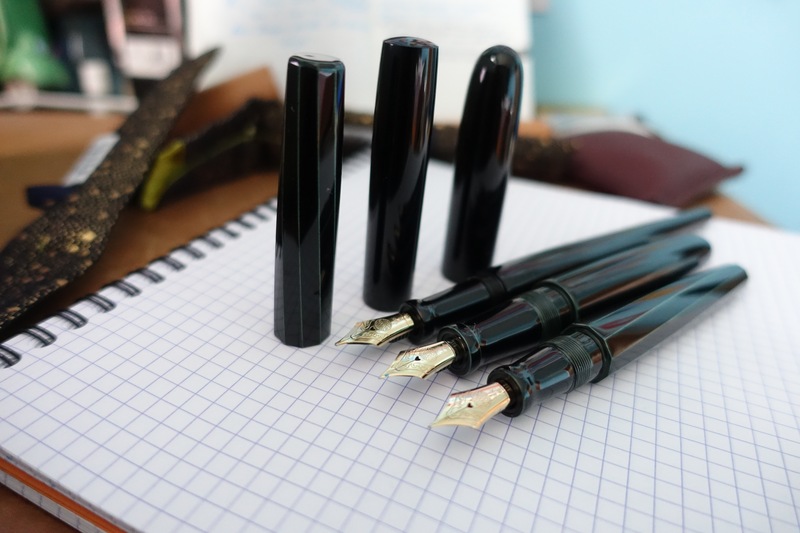 More information can be found at nibs.com (just don’t look at the price!). 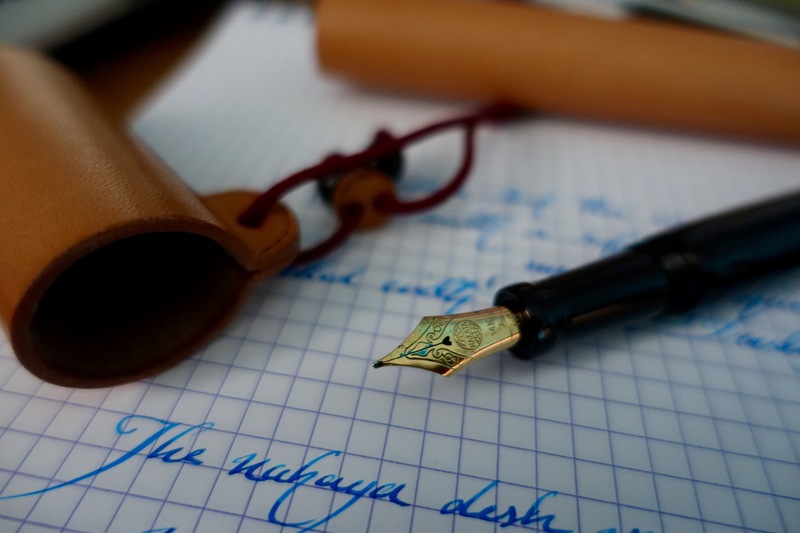 To me the shape, colour and texture of the pen brings to mind a shark swimming through the deep blue ocean. I would order it in the Rhodium trim of course, to resemble sharks teeth.